Welcome to Just A Swingin in Pigeon Forge! 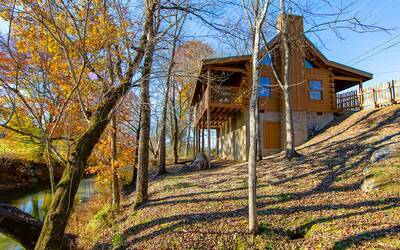 This 1 bedroom, 2 bath hand crafted Smoky Mountain cabin rental is the perfect place to enjoy your next vacation getaway. Upon entering this charming Pigeon Forge cabin rental, you are greeted by the beautiful natural wood accents and large picture windows. The cozy atmosphere makes you feel right at home. The super comfy living room features a stone accented fireplace, relaxing furnishings, a beautiful cathedral ceiling with exposed beams overhead and access to the large wrap around deck. Just off of the living area is the fully equipped kitchen. Prepare, cook and serve your favorite meals and recipes while you’re on vacation in the Smoky Mountains. There’s also a nearby dining table with stunning views that seats up to four people comfortably. Located on the main level of Just A Swingin is a wonderfully relaxing queen suite with a log bed and nearby full bath. Head upstairs and you’ll enter the remarkable game room loft. Play an exciting game of pool or kick back and enjoy the view from above the treetops. Also located on the upper level is the amazing loft king suite with a full bath. The beautiful wrap around covered deck is truly a special place to enjoy the Great Smoky Mountains. You’ll love the custom log patio table, rocking chairs and incredible porch swing. Outside on the covered deck you’ll also find the restful and soothing bubbling outdoor hot tub to relax your cares away. 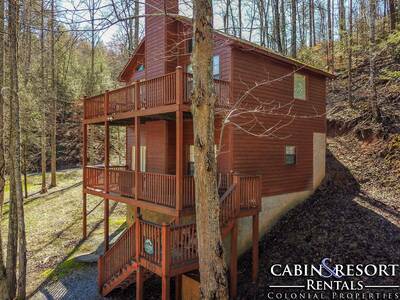 Just in case you need to do a little work or want to browse the web while vacationing in the Smoky Mountains, this cabin has you covered. You and your guests will have complimentary high speed internet access and free unlimited long distance calling. When planning your next Pigeon Forge cabin vacation, be sure to reserve your stay at Just A Swingin. With its spacious floor plan, tranquil setting and relaxing features, you’re sure to love every minute of your stay in the Smokies at this wonderful cabin. Plan your getaway today! A: It has a wooded setting but also has mountain views, it is approximately 10-15 mins outside of Pigeon Forge. A: Hi JC! This is a not a pet friendly property. We do have other properties on our program that are pet friendly. “ We stayed with colonial properties Just a Swing’in for our honeymoon 3yrs ago. It was perfect and very convienant access. Immaculate cabin for a great price. “ We really enjoyed our trip to Pigeon Forge. We celebrated our 25th wedding anniversary. I have also recommended your property to our family and friends. “ We had never been to Pigeon Forge before and booked "Just a Swingin" online. It has everything and was so comfortable, not to mention the view was breathtaking. One of the best vacations EVER!! “ We truly enjoyed our quiet, peaceful stay overlooking the smokey mountains! Relaxing with a cup of coffee on the porch was one of my favorites, as was cooking bacon,etc. as I enjoyed vacation time with my mom and cousin. Thank you for the beautiful cabin. “ Just a Swingin has by far been the best cabin we have stayed in. The view is wonderful the cabin was so comfortable and homey. We are planning to stay there next year. Maybe sooner if we can. “ The cabin was very clean and felt like home. The staff at Colonial were great. The view from the loft was awesome. The mount the tv was on in the loft/master bedroom was full rotating which we very accommodating. Great cabin for 4 or less people. “ My family of four had a wonderful and relaxing time at the cabin!! It was close to town and the cabin was so peaceful! My children loved playing pool with my husband and myself! They made up their own game of “spool” and we had a great time! We used the hot tub which was relaxing and fun as well!!! “ Just-A-Swingin was perfect for our greatly needed R&R weekend getaway. 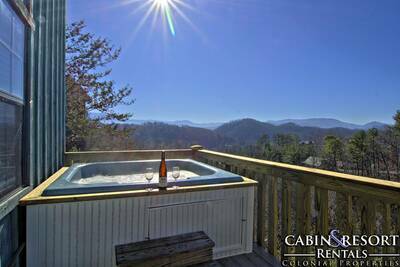 The view, the hot tub, the comfortable beds, exceptionally well stocked kitchen, beautiful,peaceful,warm/cozy cabin. We have just become empty-nesters & are caretakers for my 83yr. old Nana, just been under lots of stress & pressure and desperately needed to get away & reconnect. So the 1st of the new year God just dropped it in my spirit to cabin in the mountains. I had 3 requirements in mind when I began searching the web for our cabin:1)mtn. view 2)log bed 3)fireplace. It was as if Just-A-Swingin was custom made for us! “ Our weekend at Just a Swingin went above and beyond our expectations. It is the perfect getaway for a quiet, relaxing treat. The cabin was clean and cozy and has everything we needed. We can't wait to go back and have already booked another visit. “ The view from Just A Swinging is breath taking at sunrise. “ We really enjoyed our stay at Just a Swingin cabin. The view from the loft was one of the main reasons we picked it -- Beautiful mountain view. We could be in the hot tub on the porch and no one could see us. The privacy and mountain view was exactly what we were looking for. 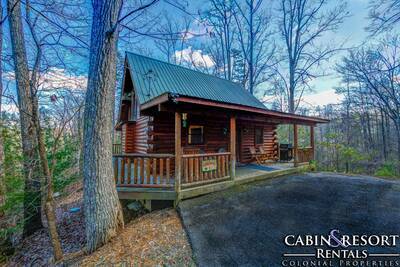 “ This cabin was better than we could have imagined for our honeymoon in the Smokies. 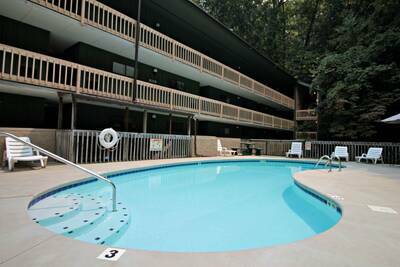 It is in a private, quiet location-yet is only about a 8 minute drive into Pigeon Forge. The cabin has that wonderful "woodsy" smell and is decorated very nicely. Everything was spotless! The view out of the loft is amazing- we got to wake up to the sunrise. The stay and play passes are a huge money saver and allowed us to do some really fun activities we may not have done otherwise. We will be back again soon! “ Loved our authentic cabin Just A Swingin! We didn’t want to leave! “ We very much enjoyed the cabin. It was clean and we felt at home. The staff at Colonial Properties were very helpful and courteous. We will rent through them again and recommend them to our friends. “ We loved it so much, we have already booked it to come back for Thanksgiving. “ Everything was really clean and organized. Extremely relaxing experience for my wife. “ Just a Swingin is a great place to stay and at the right price. The view from the loft is breathtaking. This is the place where I proposed to my future wife, so we will be back. “ The cabin was very nice an clean. All the amenities that was listed was there. And my kid's and I loved the area. It's was are first time going to the Smokey mountains and will differently be going back. For another family vacation. And I'll book it through here again. “ My wife and I rented the 'Just a Swingin' cabin for our first trip to Tennessee. The cabin was everything we were expecting from the pictures, and the view was breathtaking. We live a very busy lifestyle, and were both looking to get away to unwind. From our cabin you could hear no traffic, and woke up every morning to the sound of birds serenading us. It was a wonderful experience, and we definitely plan to visit again and again. We will definitely use Colonial Properties for our next trip. “ The cabin was very nice & well kept. Had everything we needed. Awesome views. Would definitely recommend this cabin to friend or family. “ We enjoyed our 3 night stay in Just a Swingin. The cabin was very comfortable and the view was beautiful. We especially appreciate the privacy that the cabin provides. Our stay was so relaxing. The staff was very professional and polite. We look forward to our next mountain vacation with Colonial Properties. “ This was our first time using a rental cabin and now I don't know if I will go back to hotels. I loved everything about Colonial Properties! “ Overall the cabin was great. Great location. Secluded but close to town which was what we wanted. Hot tub and pool table were great added amenities. It was peaceful drinking coffee on the swing on the deck in the morning. “ Enjoyed our three night stay at Just A Swinging cabin. View was beautiful and the cabin was very nice and cozy! Colonial property employees were very friendly and helpful. “ The cabin was very nice and we enjoyed our stay very much also. We will come back again. Thanks for a great get away. “ Very nice cozy cabin. “ The cabin was excellent, very clean and a very quiet place... and very private... loved it and would come back again even to the same place. “ Last minute plans, and we only had one night passing through, and usually book through Barbara's Rentals, but the last two times they couldn't accommodate.I have already given 2 people your website. I will call again for our next trip to the Smokies. “ Nice cabin! Had a lovely time! “ The cabin was clean, really liked the real logs. Great view and short drive to all attractions. Cabin had everything we needed. Kids enjoyed the wildlife a lot. “ Enjoyed the cabin and the stay. “ Our stay at Just A Swingin' was wonderful! Beautiful view through the upstairs windows and we loved how close it was to Pigeon Forge but still secluded. We wish we could of stayed longer! “ We enjoyed the peacefulness and privacy of our visit. The cabin was amazing, awesome views and the distance was good too. Wasn't to bad to get to parkway and attractions, and also wasn't a bad distance to Gatlinburg. Can't wait to come back up there in the fall. “ Our stay in the beautiful cabin, Just A Swingin, was wonderful!! The view was breathtaking from the swing and from the loft. It was beautiful to lay in bed and to be able to see the stars. We enjoyed eating breakfast on the deck and relaxing in the hot tub after our hikes through the mountains. We had a great vacation and can't wait to return. “ Cabin is clean and comfortable. The view is gorgeous and it is very peaceful. We will return for our 3rd trip next October or November. Checking in and out is very easy. “ We had an amazing experience. The cabin is wonderful and well kept. Customer Service was very good. “ We had a wonderful time! It was very relaxing and very beautiful. The cabin was well stocked and we didn't need for anything. “ They cabin was spectacular. Had all the things we needed and the location is great. “ Cabin was clean and peaceful. It was really close to everything as well. “ The getaway for my husband and I was very nice. The cabin was quiet and the view was so nice to wake up to in the mornings. I love a fireplace and it was just cool enough that we could use it. It was just a cozy time for us. Thanks so much for the chance to stay in a cabin instead of a hotel. “ Everything was spectacular. My 4 year old boys favorite word that vacation was "AWESOME!" and it totally was. The cleanliness, privacy and amenities were AWESOME! We will definitely be back. Love the Smokies and love the cabins.